They may have varied backgrounds, but Daniel de Vries, Rony Argente and Shimon Bohbout have successfully teamed up to run a trio of Schnitz restaurants. Daniel, Rony and Shimon run Schnitz QV in Melbourne’s CBD, Ballarat and Bendigo. Before they combined business talents in 2014, Daniel, who has a business management degree, spent almost ten years working in insurance and debt collection, but also enjoyed cooking. Rony was a business banking manager with an engineering degree, while Shimon ran a fashion business in South Africa and a resort in Koh Samui, Thailand. While starting Schnitz in Acland St, St Kilda, in 2013, Rony and Daniel met Shimon at Schnitz training sessions. They became partners in QV in mid-2014 and expanded into Ballarat in 2015 and Bendigo in 2017. Daniel says they were impressed by the “amazing” product and its potential. 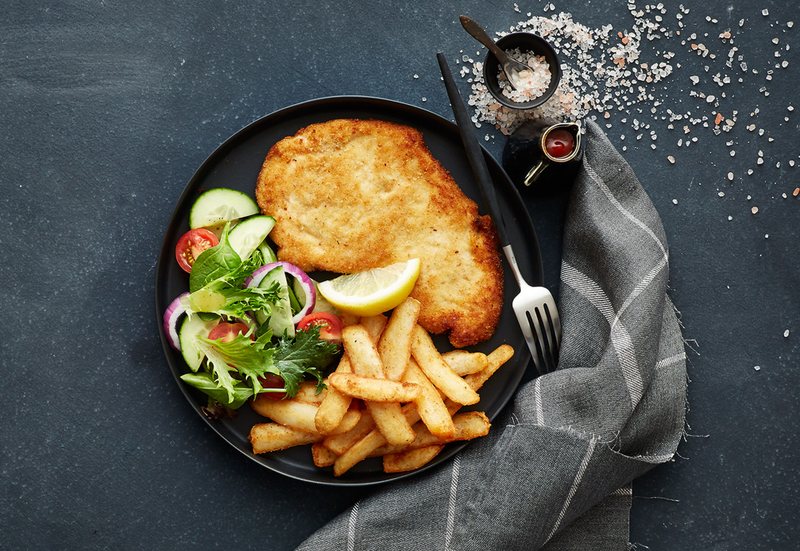 Schnitz, as the name suggests, specialises in freshly made schnitzels, as well as parmigianas, chicken fillets, rolls, wraps, chips and gourmet salads. Polish-born schnitzel expert Roman Dyduk, opened his first Schnitz in 2007. He had run restaurants featuring his signature dish, but this was different. Roman and his sons, Andrew and Tom, were determined to perfect the art of schnitzel making. Each trademark Schnitz schnitzel is made to order and pan-cooked to bring out its best using fresh ingredients and special crunch crumbs. Customers can dine in or take away. Some locations offer delivery. The QV, Ballarat and Bendigo restaurants have done well and now have 80 employees. But Daniel wanted an experienced mentor to run a fresh and independent set of eyes over their operation, workshop their ideas and provide new ones. “It was important to get someone else to look at what we were missing,” he says. Daniel had worked with SBMS before and chose to see SBMS mentor Tony De Stefano. Tony has more than 40 years’ experience in retail, including supermarkets. He and his family operated a large continental delicatessen and established a large Mexican restaurant on the Gold Coast. He now runs a business exporting coal, iron ore and other minerals to China and India. using “short cut supervision” with staff, which is the ability to prioritise supervision areas, looking for tell-tale signs in one location that may be an issue at all sites, without having to dig into all areas in all sites. Tony says the partners are now more aware of their opportunities, more customer focussed and able to slow down and analyse things more because they are delegating tasks better. He says it is difficult to measure how much things have improved, but expects profitability to increase soon. Daniel says Tony gave them great insights based on his many years of experience in various industries. “He helped us understand the need to stand back and look at things in a different way, thinking outside the box and seeing things from the customer’s perspective,” Daniel says. The sessions helped Shimon place more emphasis on growing the business, while Rony felt it was important to get Tony’s feedback on things that he hadn't encountered before, as well as advice on how to better train staff. Shimon, who has more than 15 years’ experience in retail and hospitality, found Tony’s insight and perspective of great benefit. “One of the key things I took away from the mentorship program was acquiring the skills and abilities to work more ON the business rather than IN the business,” he says.